153 Fish Camp is remote (that's one reason we love it!) We're located on Prince of Wales Island, on the North end near the small community of Whale Pass. For those less adventurous (or on a tight time schedule), you can fly commercially via Alaska Air to Ketchikan and take the ferry to Hollis or, fly into Wrangle and take a chartered jet boat or float plane to Whale Pass. Please note-- the Ketchikan airport shuttle bus was back in business this past August but it is unknown if it will be in operation this year(907-225-9800). That leaves a Taxi, there are at least three (Sourdough Cab (907) 225-5544 $), or walk on to airport ferry ($5.00)and catch "The Bus" ($2.00)(at the airport ferry parking lot) and ride to the Hollis ferry terminal. There are long (88 feet elevation gain/loss), covered ramps from the airport terminal to the airport ferry and from the airport ferry to the Ketchikan parking lot. There are carts to rent on both ends of the airport ferry terminal. 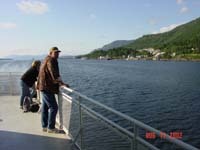 The ferry can be bypassed altogether by catching a scheduled float plane from Ketchikan airport to/from Whale Pass http://www.taquanair.com/. Of course, you'll miss the nice ferry rides.